How can eating a slice of coconut cheesecake feel so rewarding? Maybe it has something to do with those famous chocolate wafers. Have you ever had those, from Nabisco? It comes in a yellow box, and each chocolate wafer taste like a flattened Oreo (just the cookie part, no cream filling). 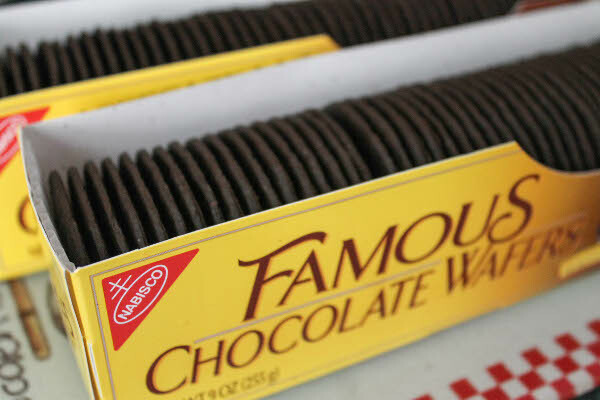 I remember looking for these famous chocolate wafers about a year ago and my grocery store was constantly out of stock (are they that famous?). 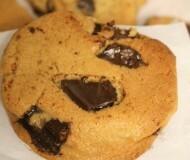 I remember bookmarking recipes to make homemade chocolate wafers but never getting around to it. And I remember the slight high I felt once I found those wafers. Because I knew they would make the perfect base for icebox cakes and chocolate crusts. So when I decided to make cheesecake again and used those chocolate wafers in the crust, I felt a small sense of victory. 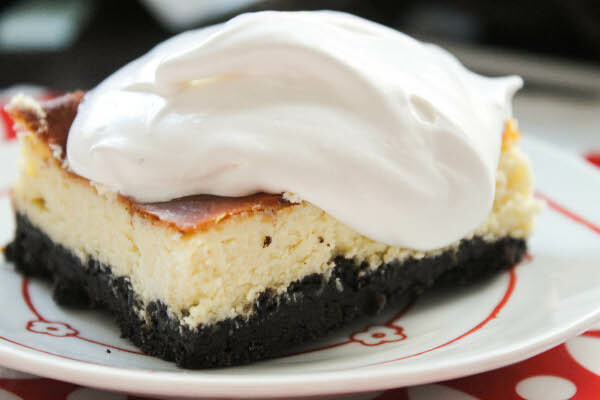 Those famous chocolate wafers lent a deep, almost bitter, dark chocolate flavor to the milky coconut cheesecake. In hindsight, I would’ve added coconut flakes to the crust, too (I have a thing for double coconut treats). But I didn’t need to; the cheesecake had plenty of coconut flavor in the batter and in the whipped cream. As some of you know, I don’t have a fancy mixer (or even a non-fancy mixer) – I mix everything by hand. Even when I’m creaming butter, it’s all old-school muscle power. However I haven’t yet attempted to make whipped cream without a mixer, so I just buy the ready-made stuff from Whole Foods or sometimes Cool Whip. I mean Cool Hwip. Made me feel like I can do anything. Like I can easily cream together sugar and cream cheese until they turn smooth and silky. Like I can always pound out my stress onto helpless chocolate wafers and end up with a delectable crust. Like I can really bake cheesecake without being scared. Without a springform pan. Nor a mixer. And I did. Easily, always, really. Sure, those are small victories. But my point is… eating just one bar of this coconut cheesecake feels really rewarding. Now how can other cheesecakes compare to that? Make the crust. Mix chocolate wafer crumbs and butter in a medium bowl. Transfer crumb mixture to a 13x9x2 baking pan (I lined mine with parchment paper and lightly buttered it). Press evenly onto bottom of pan. Bake until set, about 15 minutes; cool. Make the filling. Cream together cheese and sugar until smooth. Add coconut milk, heavy cream, salt, vanilla, eggs, and yolk. Mix well until smooth. 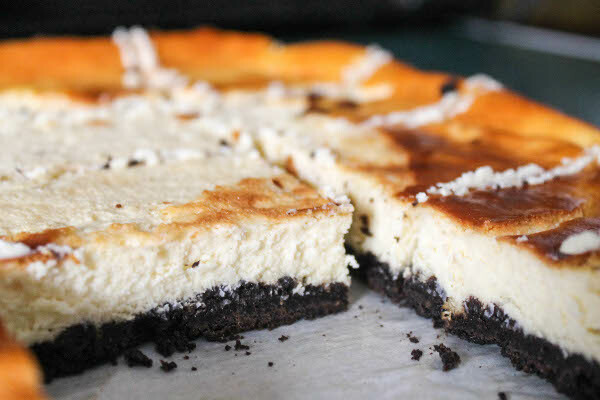 Pour cream cheese custard over cooled crust; bake until cheesecake jiggles slightly in center, about 1 hour, 15 minutes. Cool, and chill for 4 hours. Make the whipped cream. Whisk cream, coconut milk, and confectioners' sugar until stiff peaks form. Dollop over each square and serve immediately. Do you have a favorite cheesecake recipe? Please share in the comments section! holy moly. i’m hungry for a nice big slice!! oh, yup, i could definitely eat a few of these. nice work. Looks delicious! I’ve been craving all things coconut the last few months, so this fits in my desires perfectly. It will be made! My two other favorite cheesecakes are Ellie Krieger’s ricotta cheesecake (no crust, but a lot healthier and still tasty, especially with a raspberry topping) or Alton Brown’s classic cheesecake recipe (intense, but thick and rich and deliciously unhealthy). I’m impressed with your all-muscle approach to baking. I wimped out and bought a hand mixer, which I use for almost everything. Hi Ashley! I will have to check out that ricotta cheesecake soon! Yes! The dulce de leche cheesecake bars I made the last time are also surprisingly easy, but looks and tastes so fancy! I honestly don’t think I have ever had those wafers! Clearly I am missing out. I too mix everything by hand, this is totally the dessert recipe for me. I have never had these famous wafers but that cheesecake looks amazing! I love those chocolate wafers. The cheesecake looks tasty! 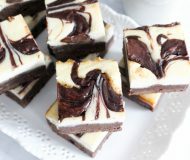 I made a great chocolate-vanilla swirl one a few months ago and think it is my new favorite recipe. Chocolate wafers, coconut and cheesecake? I am so into this. Look at that gorgeous caramel-colored crust! I am such a huge fan of coconut, too. Small victory? Sounds like a big one to me … and no dropping on the floor! ;) Thanks for the shout out! P.s. bummed I didn’t see you at the Talking Taste last week: I was there too! I’m going to the last one in August, as well. Last night, I had the strangest craving for cheesecake. And today, you have a blog post about cheesecake! Perhaps I am destined to make (or at the very least, eat), a slice of cheesecake! I love all cheesecakes really…but THIS sounds absolutely incredible. Chocolate and coconut are one of my favorite combos! Wow. . . I LOVE coconut, and this looks amazing. I am a new follower and I am now craving this divine recipe. I love coconut and chocolate and cheesecake. I remember my mom hoarding those chocolate wafer cookies from us kids when she was making a rich chocolate crust for her cheesecakes. My personal favorite cheesecake had mandarin oranges in a sauce, but the recipe was lost many years ago. This looks like it could be a new favorite! Hi Kate, thank you for the comment and welcome to my blog! If you make this recipe soon, keep me posted! Take care. You’re right though, I bet this would be phenomenal with coconut in the crust. This looks so exotic, yet straight forward. 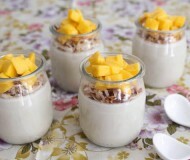 Love coconut and will have to try this sometime! This cheesecake definitely comes with a serious dose of satisfaction! Both because it is filled with so much awesomeness and also because you pulled it off so perfectly! I’m really loving everything coconut lately and this cheesecake is no exception. It looks so good! Plus chocolate and coconut are such a perfect combination! 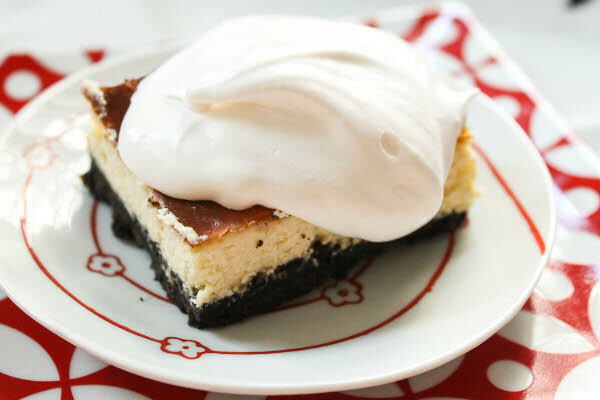 You did it – you managed to combine my love of cheesecake and coconut into one dessert :) Looks SO good! Coconut cheesecake…..I think I’m in heaven. I can never pass up on anything coconut. There are coconut lovers and coconut haters…and I am definitely a coconut lover! Coconut cheesecake is so, so good, and I love bars. 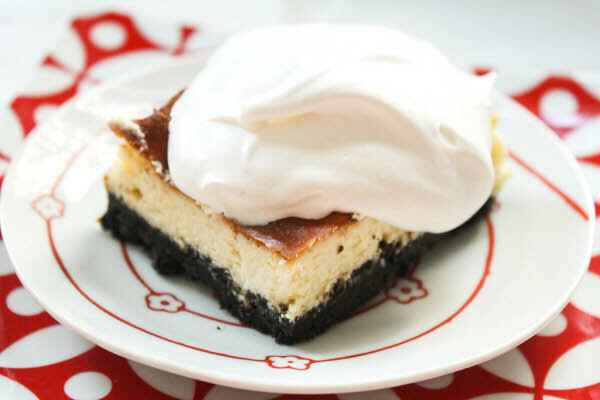 Portable cheesecake with a chocolate crust? Yes, please! I’m a little embarrassed to admit that I have a stand mixer but still like to whip cream with a whisk. Try it some time–maybe you’ll like it, too. At the very least, you get a good arm workout :). Beautiful cheesecake, Bianca! I just want to lick my screen!!! Yum! Hi Lisa! Thank you! This was really so good, I especially loved the coconut whipped cream.